Christmas is descending upon us once again, and you know what that means: the pressure of popular culture, endlessly hammering one particular thing into your brain via magazines, television, and pretty much any commercial website you can shake a candy cane at. No, I’m not referring to the pressure to buy things — that’s pretty easy to ignore. Rather, I’m referring to the constant niggling to “create traditions” for my family, especially for my kids. Make traditions! Start a new tradition! Gaaaah! And at least once every season, someone asks me if my family already has a special Christmas tradition — as if the standard ones (tree, stockings, gift exchange, Santa’s annual breaking-and-entering routine) somehow didn’t count, or weren’t enough. 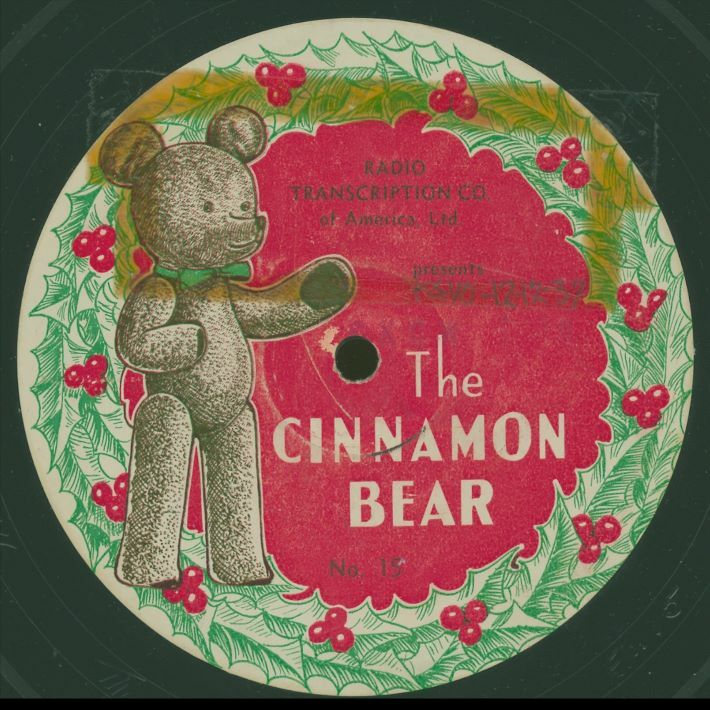 To tell the truth, I did want to do something a little special an unique for the Christmas season this year, and I think I’ve found it: listening to the 1930s children’s radio program, The Cinnamon Bear on the way to school every morning. For those of you who are unfamiliar with the program, The Cinnamon Bear was a legendary radio broadcast that first aired in 1937. It was produced by the Transcription Company of America, with the goal of creating something whimsical — specifically, something similar to the Oz books and/or Alice in Wonderland. The series depicts the adventures of Jimmy and Judy Barton, twins who meet a talking teddy bear named Paddy O’Cinnamon in their attic. With Paddy’s help, the twins embark on a journey through the magical world of Maybeland in search of a silver star Christmas tree ornament. Whimsy, indeed — there’s a grand assortment of goofy characters in this show to satisfy any kid. There’s dozens silly animals that sound like they dropped out of a Bill Peet book, and in Episode Eight we meet the Candy Pirates. Candy. Pirates. You heard me. The Cinnamon Bear was aired with a fifteen minute segment for every day between Thanksgiving and Christmas, excepting Sundays. However, if you’re interested in starting now (or in a few days) it wouldn’t be too difficult to catch up. It makes for perfect going-to-school listening pleasure. And a pleasure it is — good grief, Jimmy, Judy, and their ursal friend sound like they’re black-and-white. We’ve only listened to four episodes, and already I’ve counted about seven “gee willikers!” coming from Jimmy, and I love it. I love the fact that Paddy has “shoe-button eyes,” and I get to explain to my kids what shoe buttons are. Likewise, we had another impromptu history lesson after today’s episode (“The Inkadoos”) when our heroes are about to be thrown into an inkwell. Also, there was a mention of how ground beef, liverwurst, and onions are the ingredients of “a Dutch lunch.” Gee willikers, for a Luddite like me, it’s a bit of heaven. The production values are also pretty high here — there’s a top-notch cast of radio actors (famous in their day), cheesy-good sound effects (they really like using slide whistles) and a passle of addictive little songs. Naturally, every episode ends on a cliffhanger. Even my kids, who can’t remember a time before TV OnDemand, have a hard time turning off the iPod at the end of each morning’s broadcast. It’s hard to wait a whole day to find out what happens to Paddy and the twins, but that just makes each show a little bit more fun to savor. Besides, there’s no time like Christmastime to learn the pleasures of delayed gratification. Interested in checking out some Cinnamon Bear action? Try the Internet Archive. For further information about the history of the show, go here.